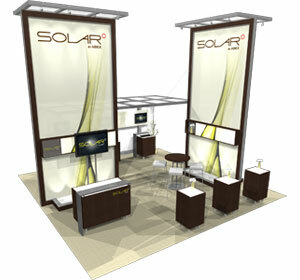 Far exceeding comparable modular exhibit systems, Solar™ is the ultimate hybrid exhibit system. Created by an award-winning studio design team—world-acclaimed for concept and impeccable execution—Solar is designed to create a limitless variety of attention commanding booth architectures. The materials and components are selected for strength and built for durability. Extensive material testing and evaluation ensure that every Solar component provides superior fit and finish; and maximum cohesion at the least possible weight. Facilitated by a computer generated packing design, the instructions for the installation and dismantle of your exhibit is streamlined by an easy-to-follow, integrated parts and a coded identification system. This significantly saves on labor and time before and after your tradeshow. Select one of the pre-made designs below, or contact a professional design assistant for inquiries on creating a custom exhibit tailored to your exact tradeshow marketing needs. Features a backwall, canopy ceiling, counters and more. Features a large backwall, canopy ceiling, counters and more. Features two towers, a conference wall, counters and more. Features a backwall, storage tower, counters and more. Features a large tower, a billboard, kiosks and more. Solar™ exhibits are manufactured utilizing materials especially selected to reduce impact on the environment. CO2 emissions are kept strictly minimum and carbon neutrality is achieved by supporting verified, high quality, high impact carbon offset and renewable energy projects around the world through Sustainable Travel International™.